It’s a genuine pleasure to introduce you to our company. We’re quite proud of our organization and enjoy telling the SWEPCO Story. We realize choosing a company to become associated with is an important decision. For that reason, we believe it is important that you choose wisely…that you look for a company that offers some minimum prerequisites …stability, a large market, quality products, a proven marketing plan, strong training and a record of success. We believe you’ll find we score very high in all of these areas and many more. In fact, we think we are quite unique. We think we offer one of the last opportunities that is flexible enough to be tailored to your personal capabilities and goals…but structured enough to insure your success. 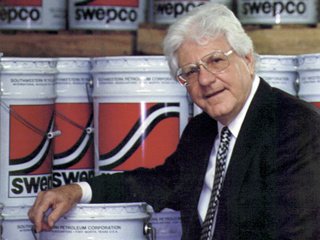 The SWEPCO Program permits you to start small and grow…or start big and get bigger. Regardless of your objectives, SWEPCO can be the answer you seek…an answer that doesn’t require franchise fees, other large investments or complex legal arrangements. Southwestern Petroleum is committed to continued growth. Our commitment to research and development of new products is firm. Our chemists and technical staff are constantly striving for improvement…the result is new improved formulations, environmentally friendly products, advanced system designs. We want you to be more than just strong>competitive. We want you to be the leader in your market. We genuinely appreciate your interest and hope the brief review of our organization which follows will convince you to investigate Southwestern Petroleum in more detail. Even if you don’t ultimately become associated with Southwestern Petroleum, we’re glad to have had the opportunity to tell you more about our organization.